During CES and MWC in Barcelona, Samsung showed off their virtual reality roller coaster ride to thousands of attendees, and it was blast, considering you never had to leave the conference hall. Now thanks to a collaboration with Six Flags, Samsung will be taking VR roller coaster rides to entirely new heights, bringing Gear VR headsets to nine actual roller coasters across the U.S. 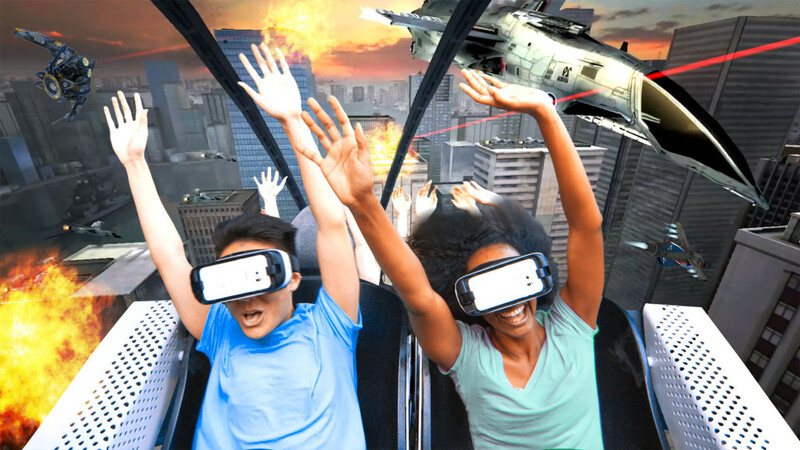 The first ride is being called the “The New Revolution: Virtual Reality Coaster”, where riders will be equipped with a Samsung Gear VR headset and transport themselves to a futuristic battle to save planet Earth from an alien invasion. Co-piloting their own fighter jet, you will have to strap in for some intense air-to-air combat action. “This remarkable technology is a definite game-changer for theme park rides and represents everything our brand stands for — delivering the most thrilling and innovative rides and attractions in the world,” said John Duffey, Six Flags president and CEO, in a news release. According to the Six Flags FAQ: The Gear VR headset is “secured with three straps – one around the head, one over the head and a chinstrap, along with a safety lanyard.” The headset will be sanitized between every ride.